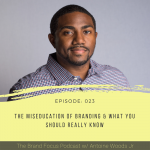 In this episode of the Brand Focus Podcast, we discuss & define positioning and explain why it should be a key focus of your business. 2:29 What is a brand? 4:10 Why Positioning is the most important element of your business strategy? 7:44 How Positioning impacts your marketing? 12:38 Is brand positioning right for your business?